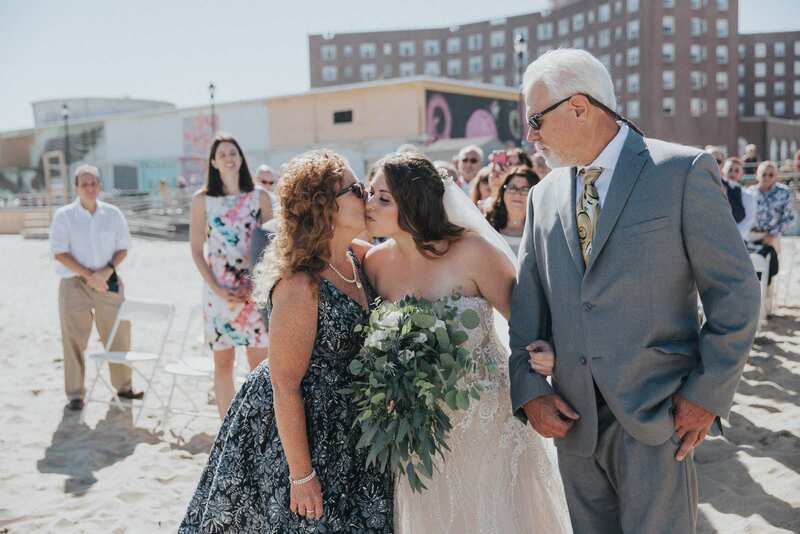 Photos of wedding day which captured the pure essence of Asbury Park and much of what makes it one of the most unique towns along the Jersey shore. 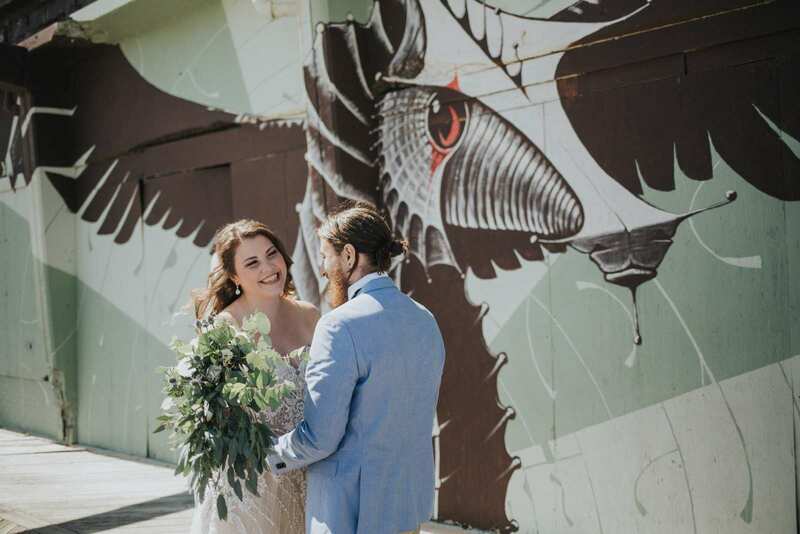 With Anna and Adam having met here years ago at Porta and still living just a few blocks from the beach they would get married on, it was the obvious choice for a wedding location! 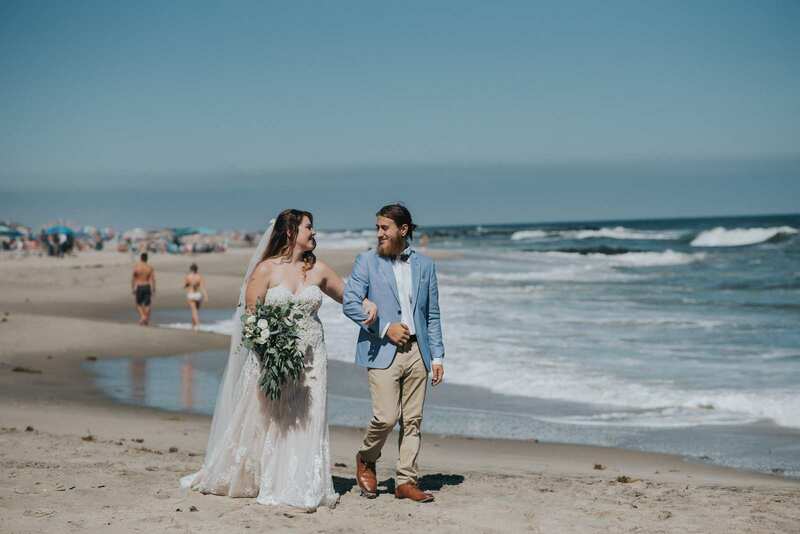 We knew from the first moment we spoke that our candid and photojournalistic style of photography would be the perfect match for a day that naturally flowed from from morning at the Berkeley Hotel, through the ceremony on the beach, and into the night with the reception at Porta. 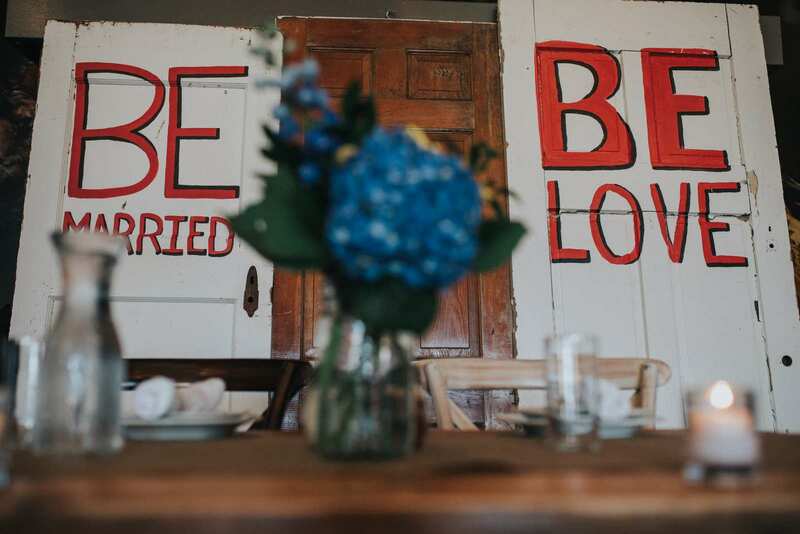 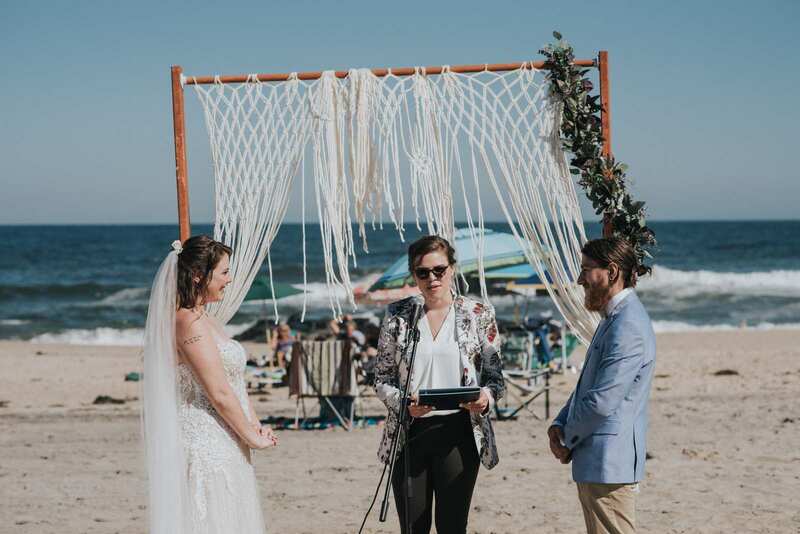 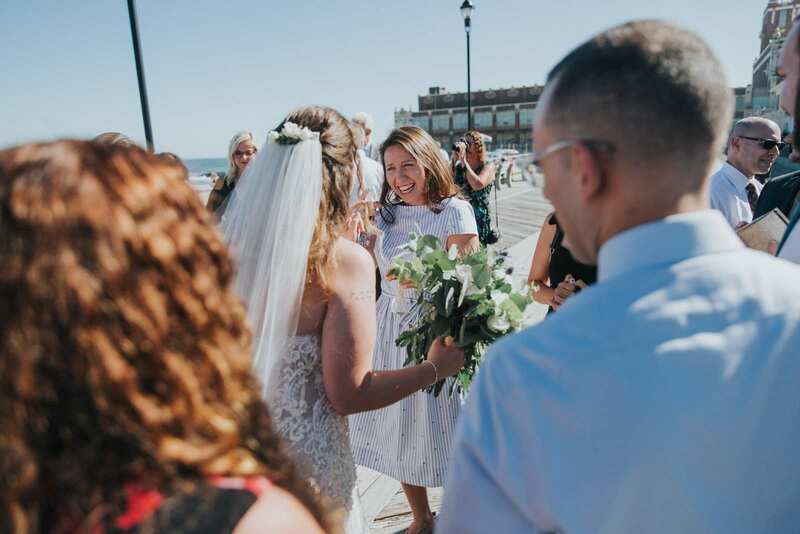 Asbury Park is one of our all time favorite places to photograph and we hope you enjoy reliving the many fun, touching, and otherwise amazing moments of their big day in the below images. 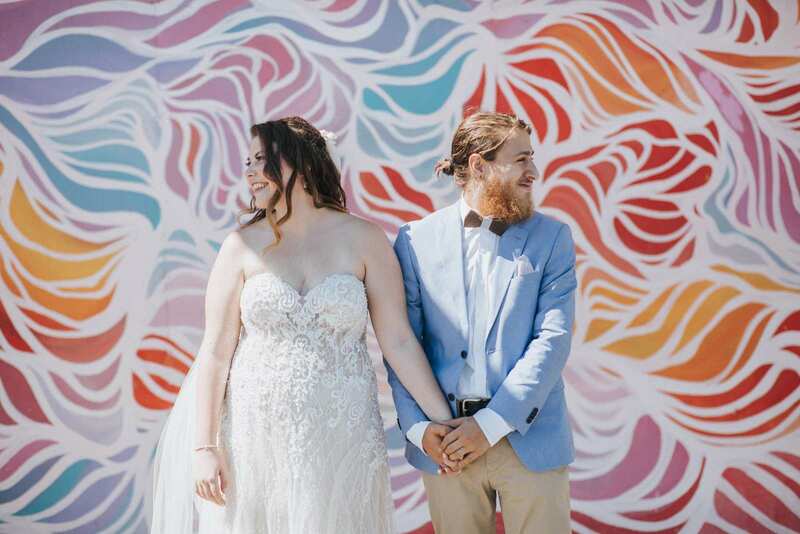 There are so many more we would love to share – we hardly could cut it down to what fits on this page! 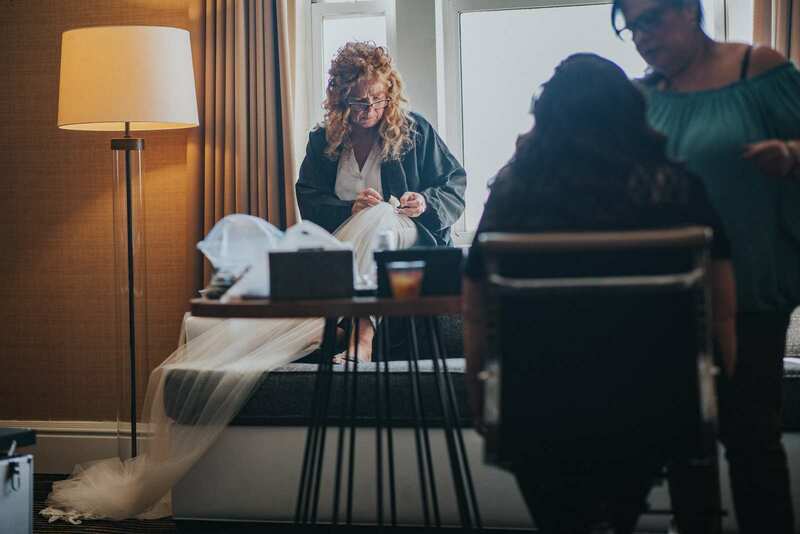 When we arrived to the Berkeley Hotel for this wedding day, we found the brides mom perched on the couch still carefully sewing flowers into the entirely handmade veil. 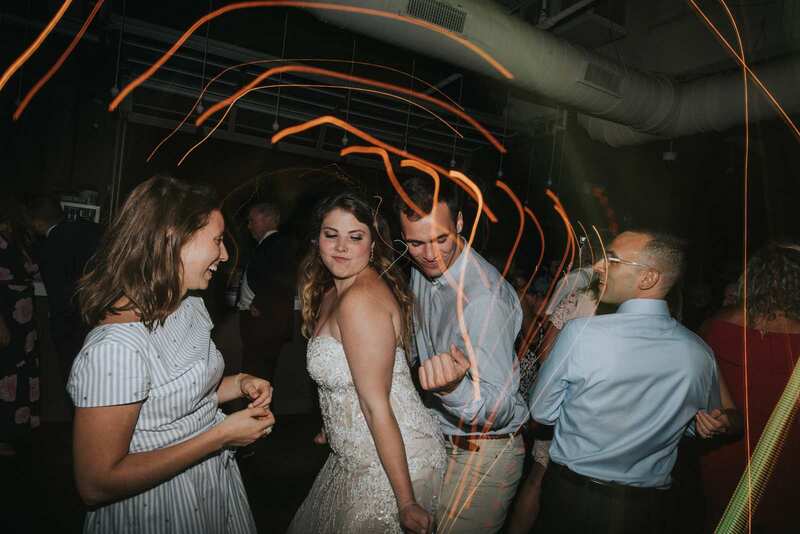 And found her sister trying to find the perfect music to set the stage for the day. 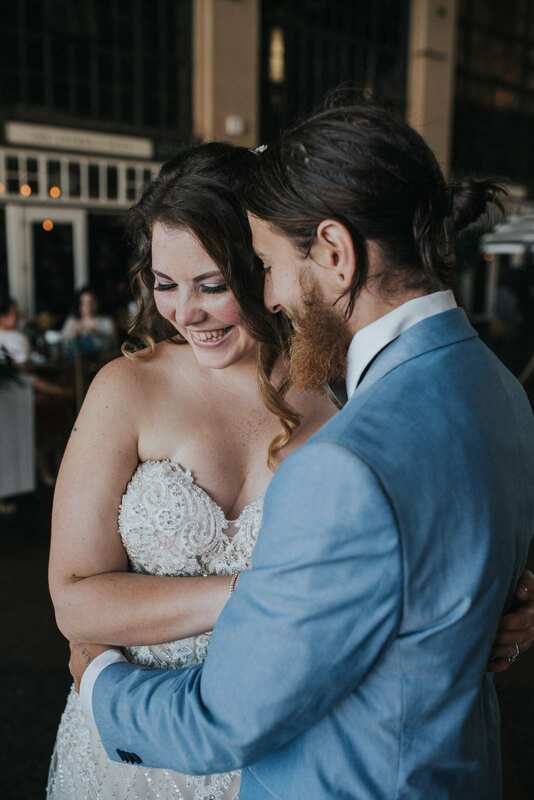 She started with the most obvious of searches :). 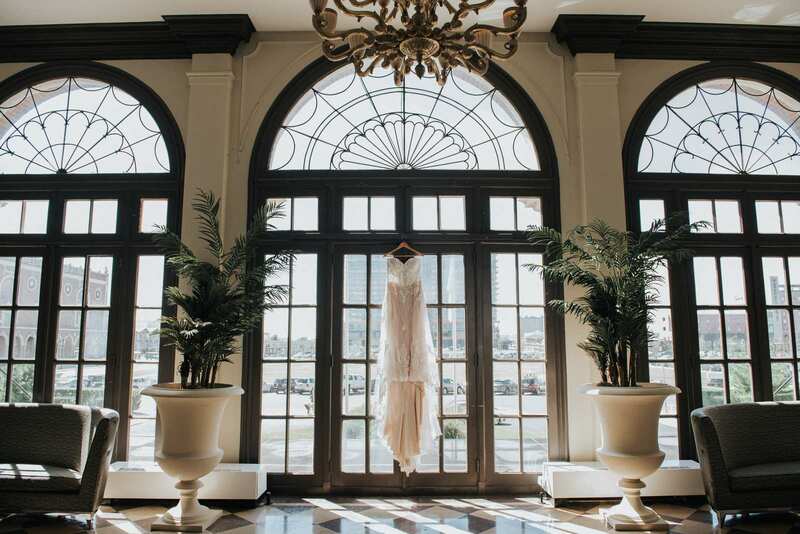 The gigantic windows of the middle lobby area of the Berkeley Hotel were the perfect place to hang the brides wedding dress. 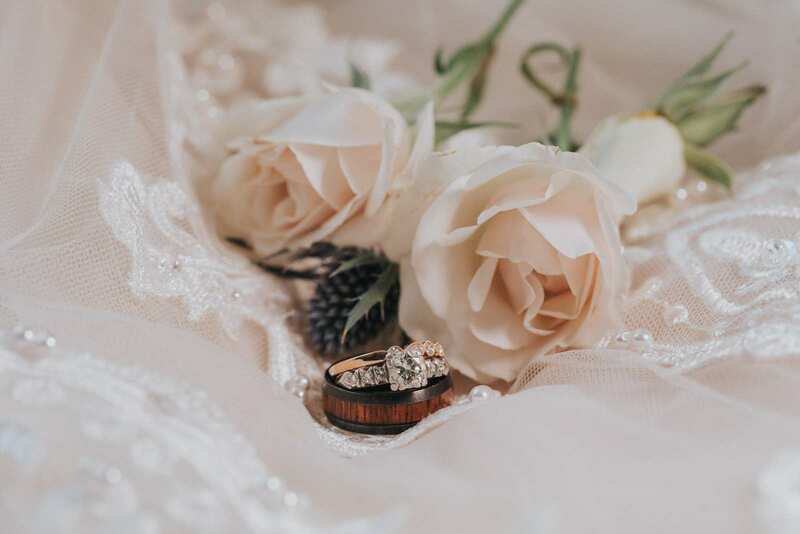 Then the dress and flowers of the veil served as the perfect place for a macro photo of the rings! 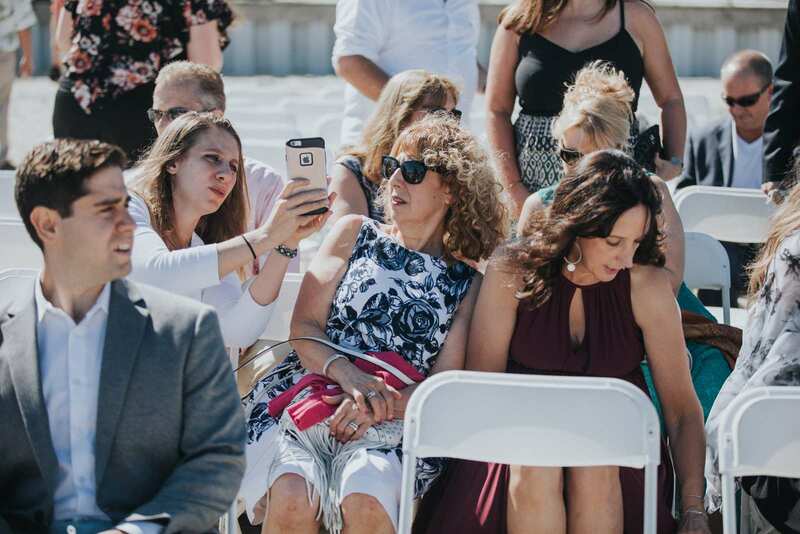 Mom and sister finishing buttoning up the back of the the beautiful brides dress! 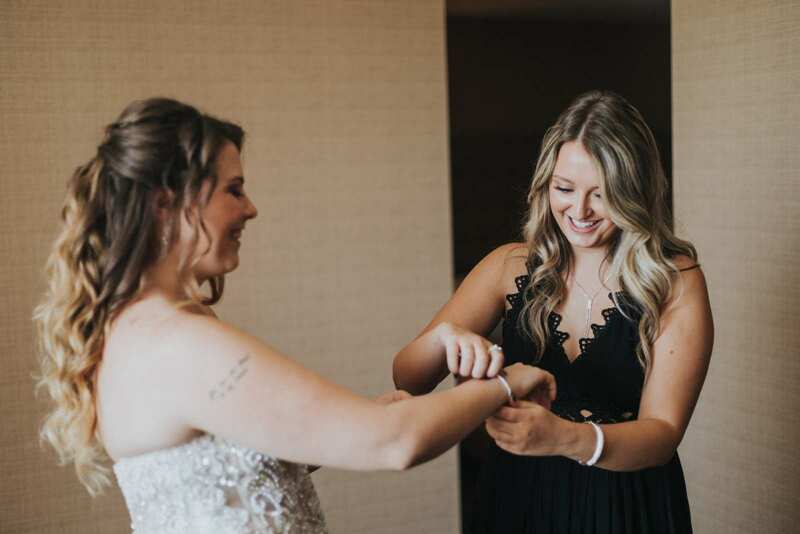 A lifelong friend putting on the finishing touches with bracelet and earrings! 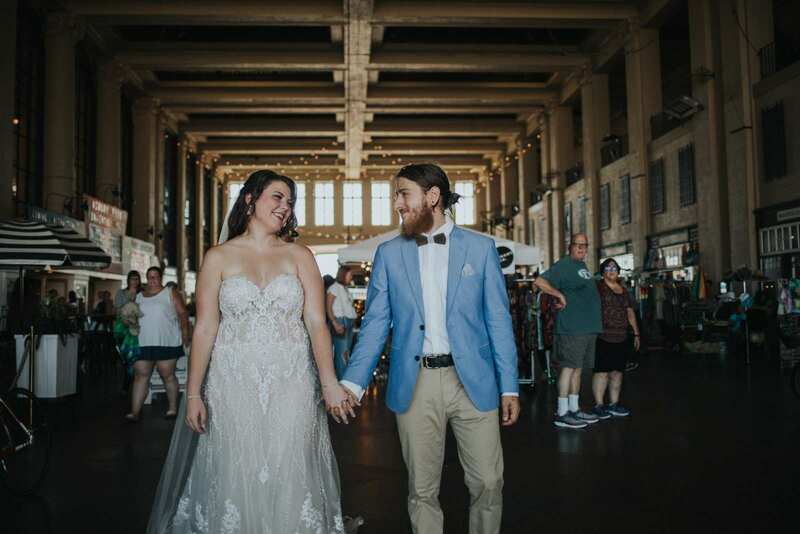 before we headed down to the boardwalk along the boardwalk for the first look on this wedding day! 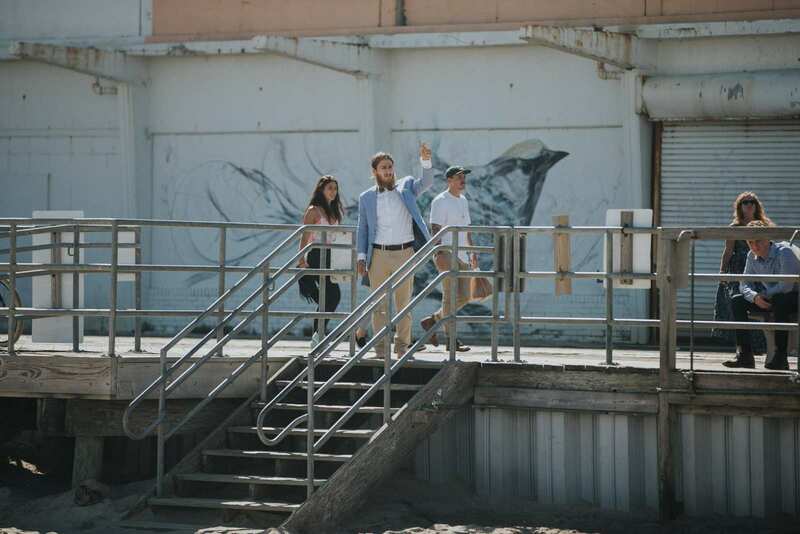 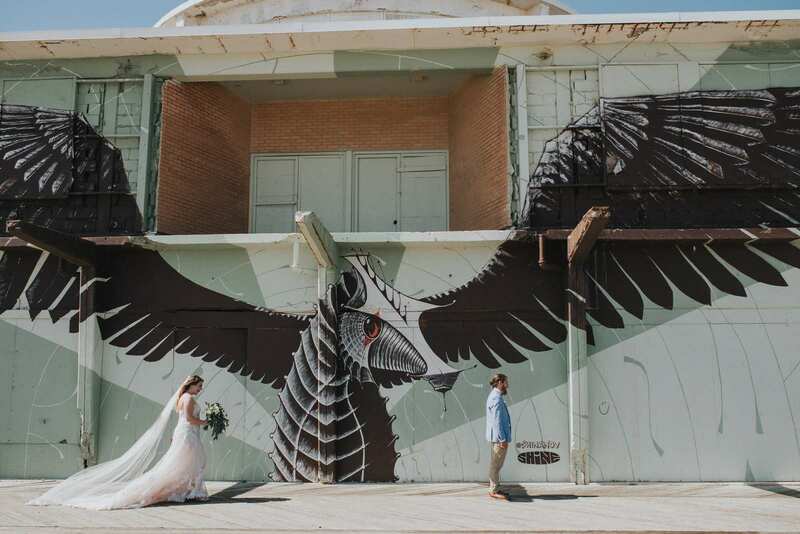 We planned the first look to happen front of one of the couples favorite pieces art and murals along the Asbury Park boardwalk! 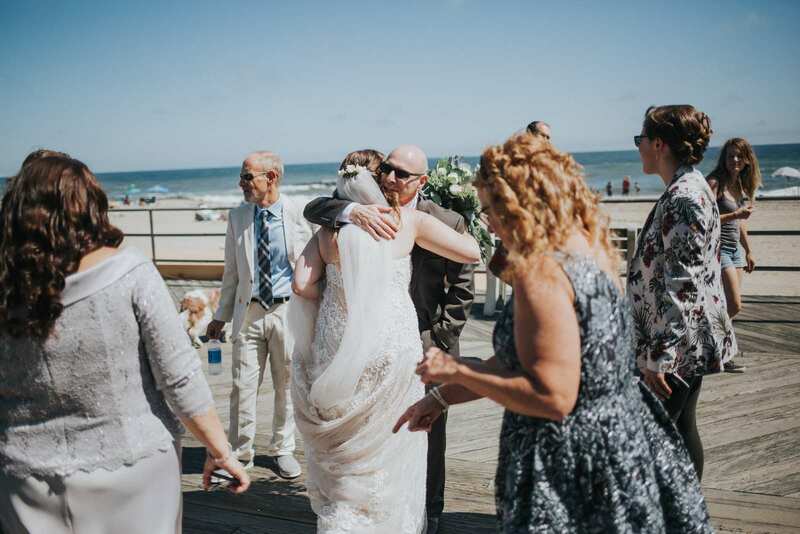 Although past beach season, there were still plenty of onlookers as Anna made her way up to the boardwalk to the groom Adam! 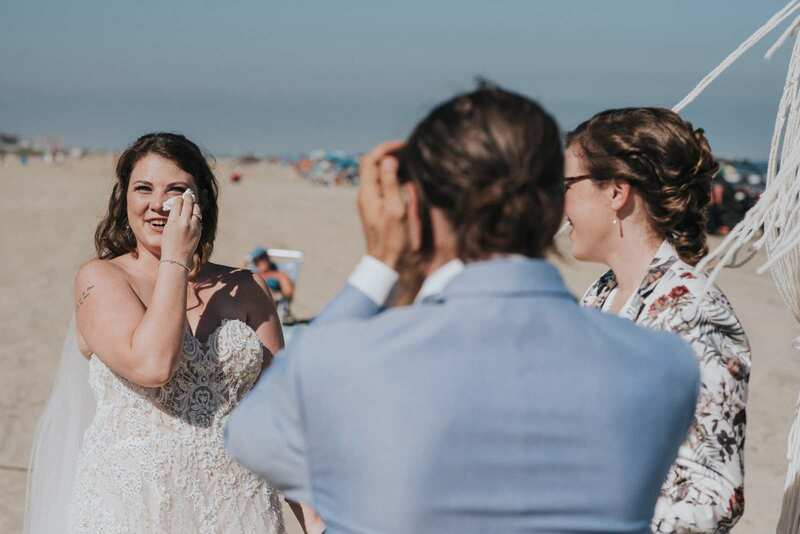 The very moment the groom turned around and saw the bride during the first look captured in between everyone enjoying the beach day! 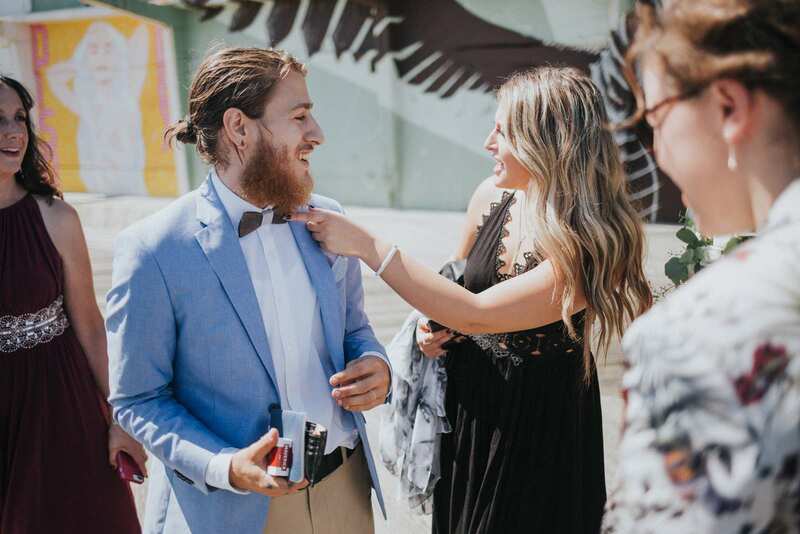 A few moments after the first look to greet the family from both sides and for everyone check out the grooms fantastic wooden bow tie! 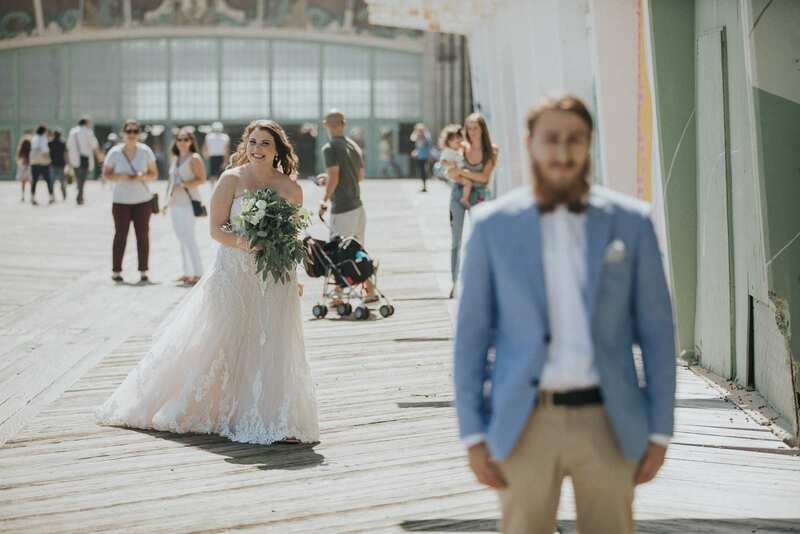 More wedding portraits and photos that we captured on the Asbury Park boardwalk and all of the one of a kind wall art right down from the Paramount Theater and Convention Hall! 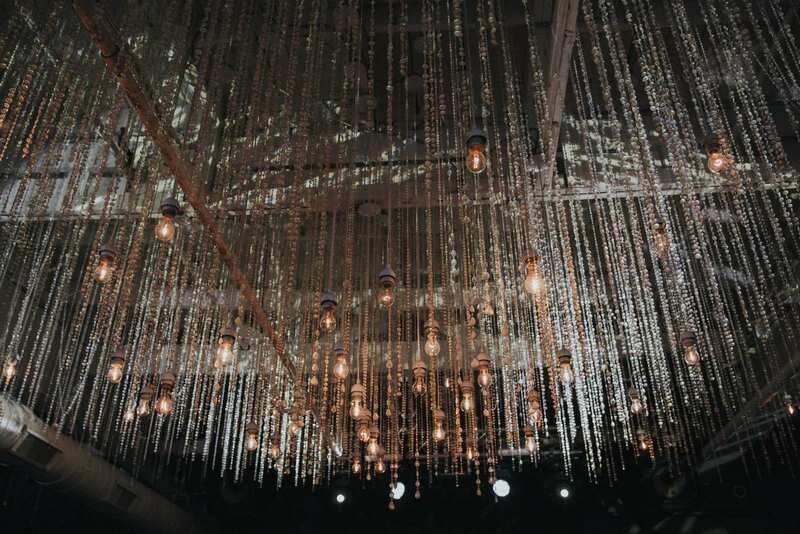 Inside convention hall the light is always amazing and soft thanks to the giant windows on either side of the building. We always make sure to every couple in here during their wedding photos or engagement session in Asbury Park. 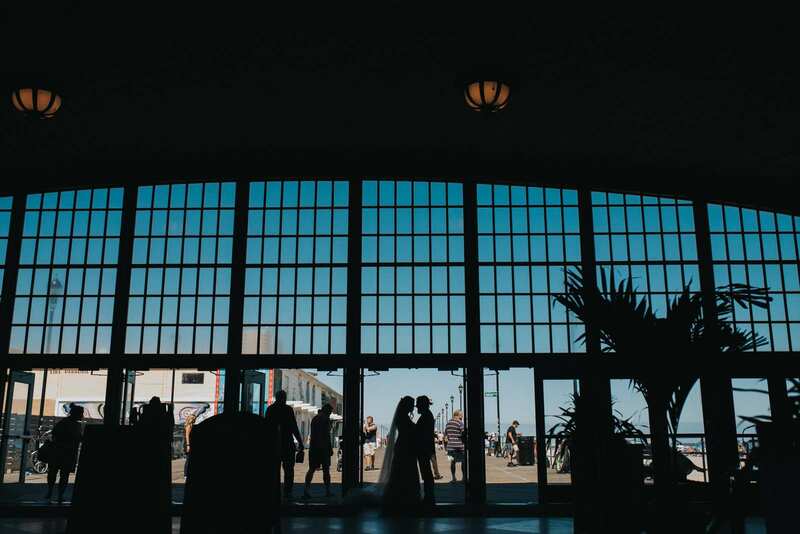 A quick silhouette under convention hall before we headed back down the boardwalk and onto the beach! 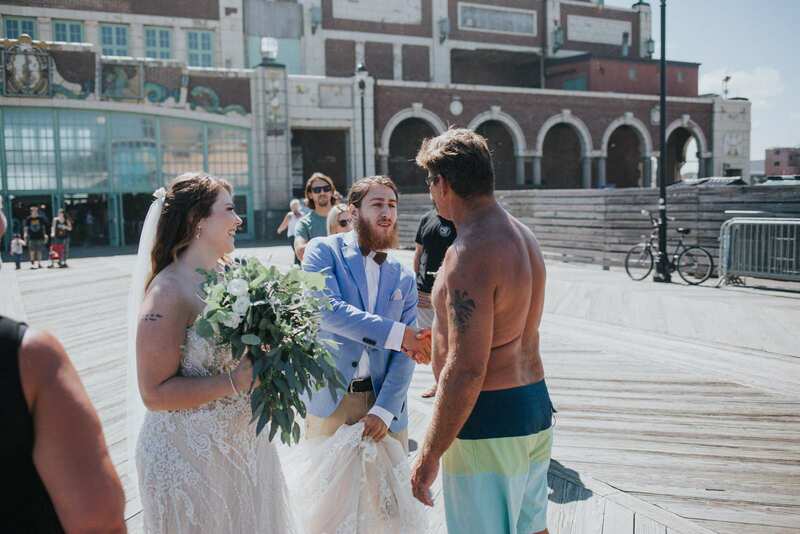 A small interruption for congratulations from what we found out was a totally random guy in a bathing suit and not actually a guest enjoying the shore before the ceremony. 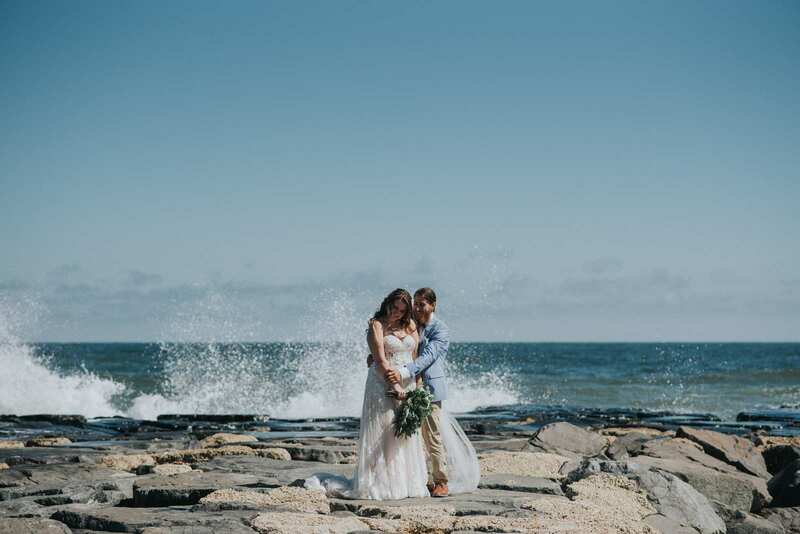 Ocean waves crashing around the couple as they cuddled on the rock jetty extending into the ocean! 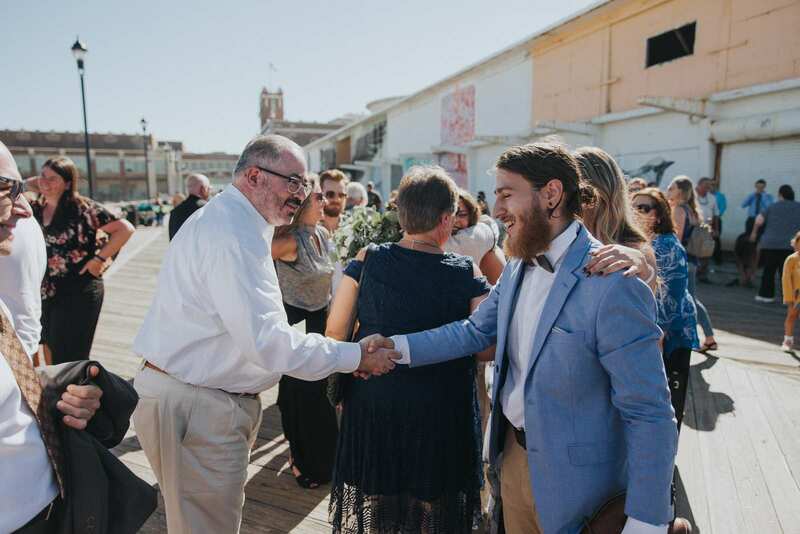 Another uninvited but super adorable guest in the form of a dog as we stood on the jetty of during the portraits! 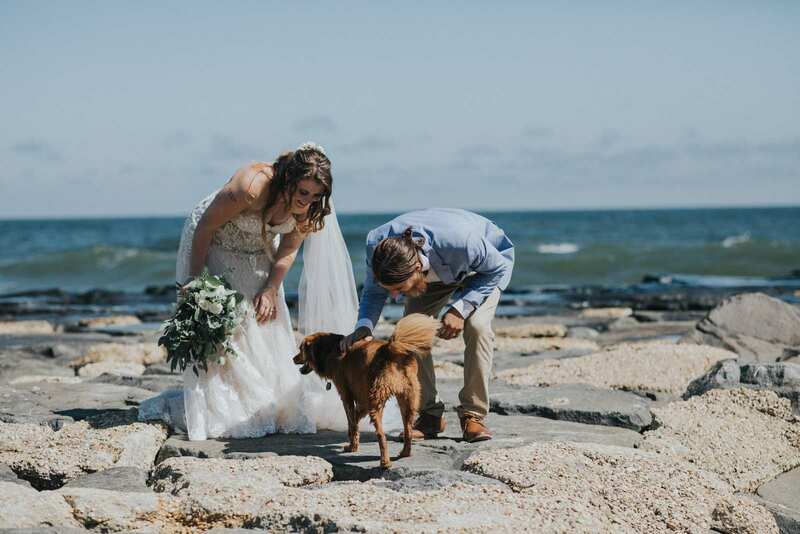 We just had to take a quick pause to give it some much apprecaited pets. 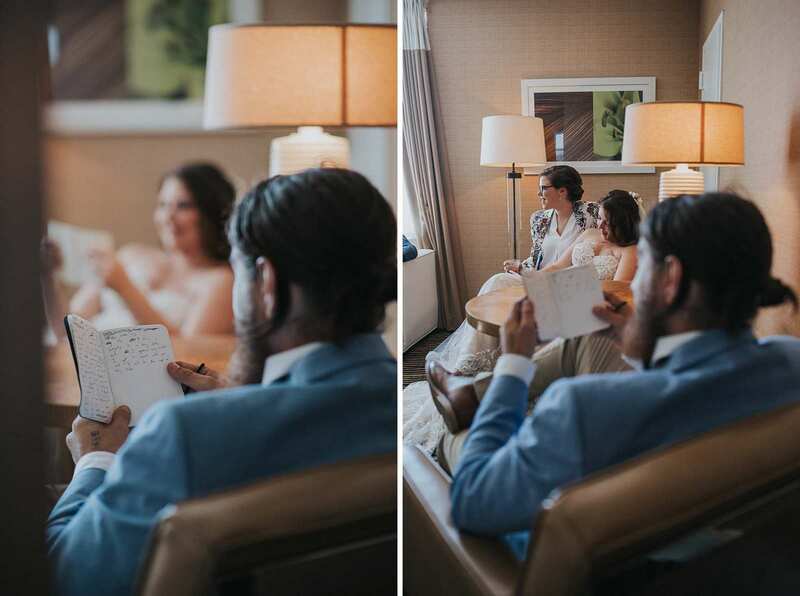 Back in the hotel, the soon to be married couple reviewed and tweaked their vows both side by side but also in silence. 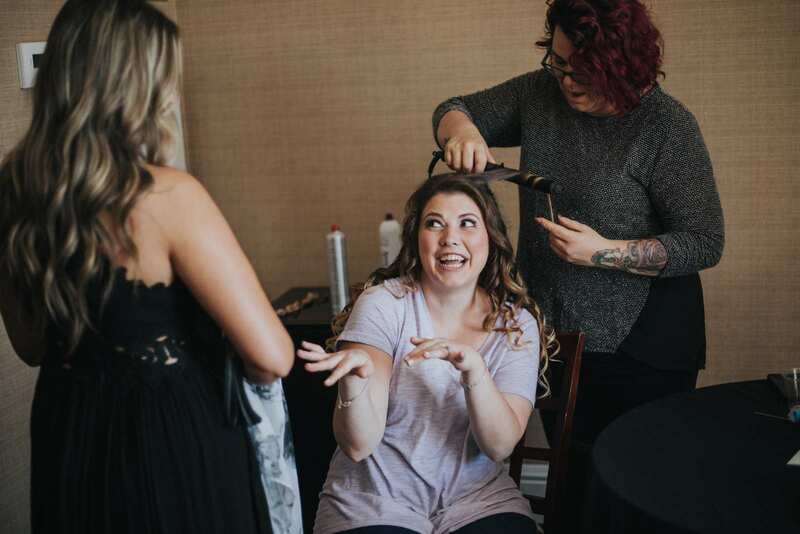 The perfect example of a moment that you can’t set up and has to be captured candidly on the wedding day! 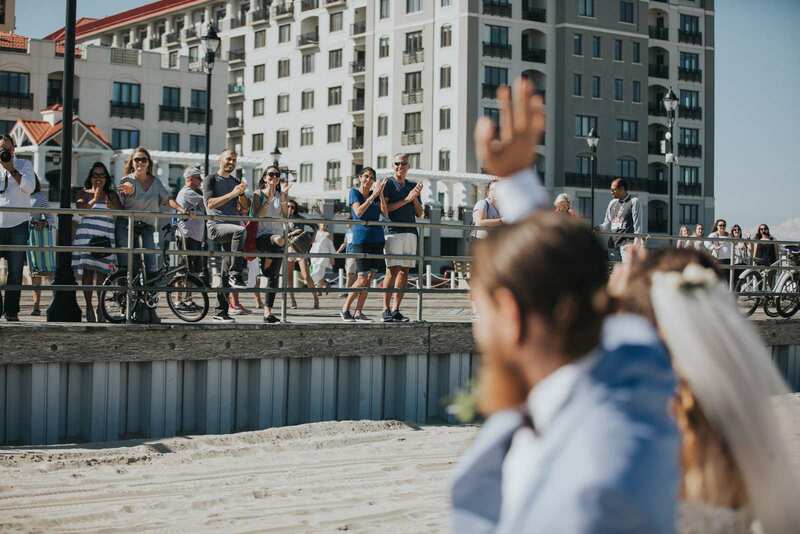 A quick thumbs up from the boardwalk by the groom to set the marriage ceremony in motion! 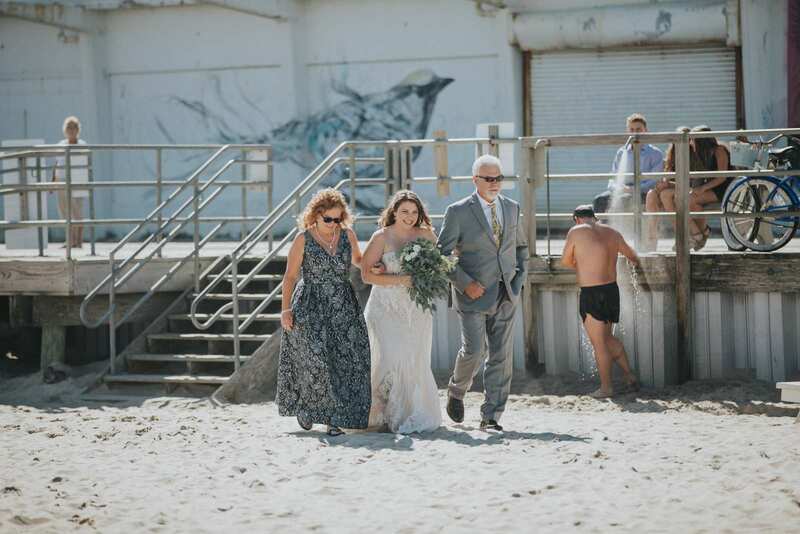 Mom, dad, and the bride make their way onto the beach full of smiles and joy. 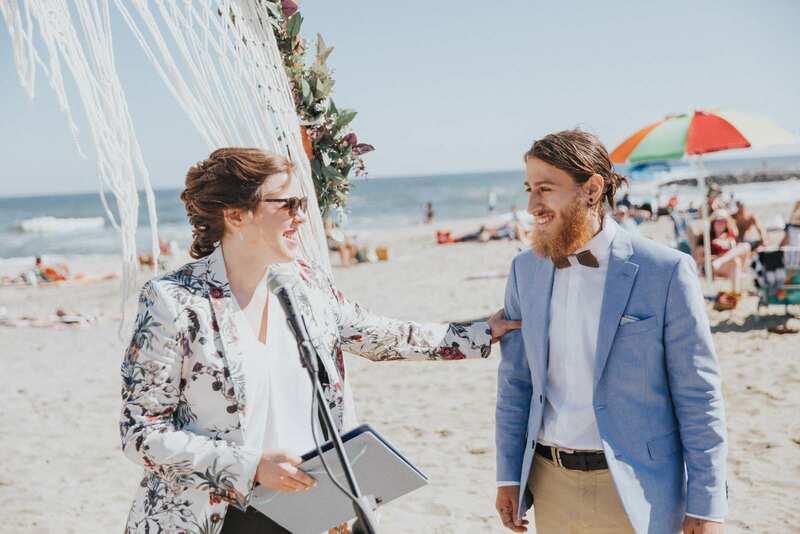 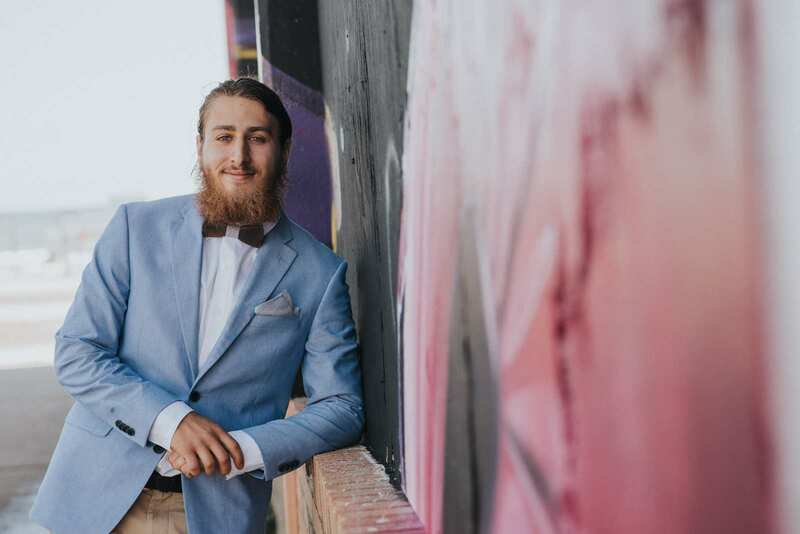 We fully believe the random person showering adds to the ambiance of what was a more casual and go with the flow type wedding day. 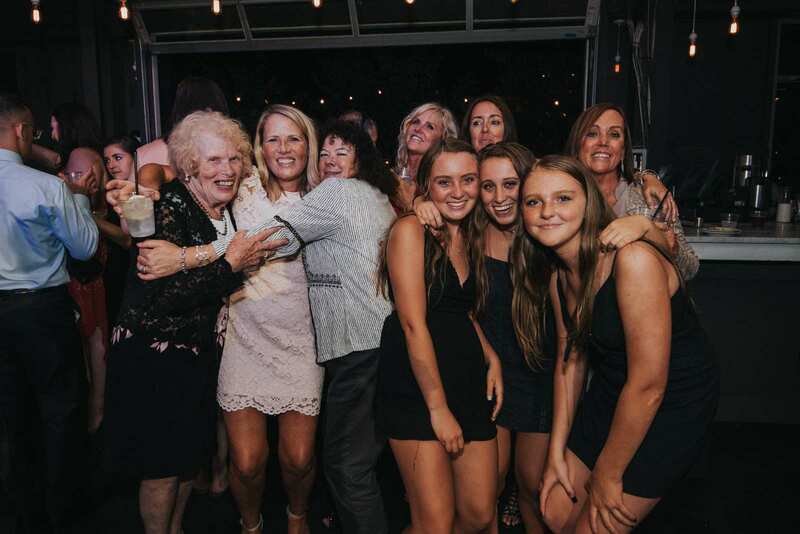 We promise their are plenty of photos without him as well! 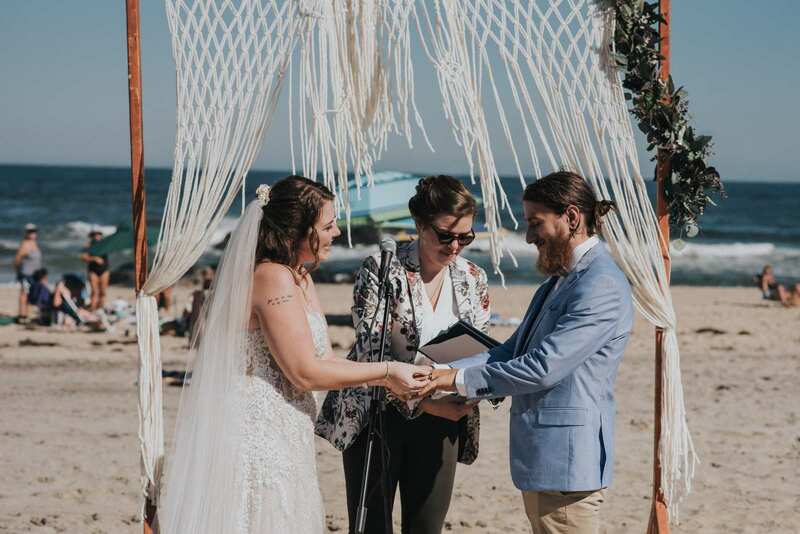 Bride and groom in front of their hand made wedding arch on the Asbury Park beach ready to take on the world together after this whirlwind of a day. 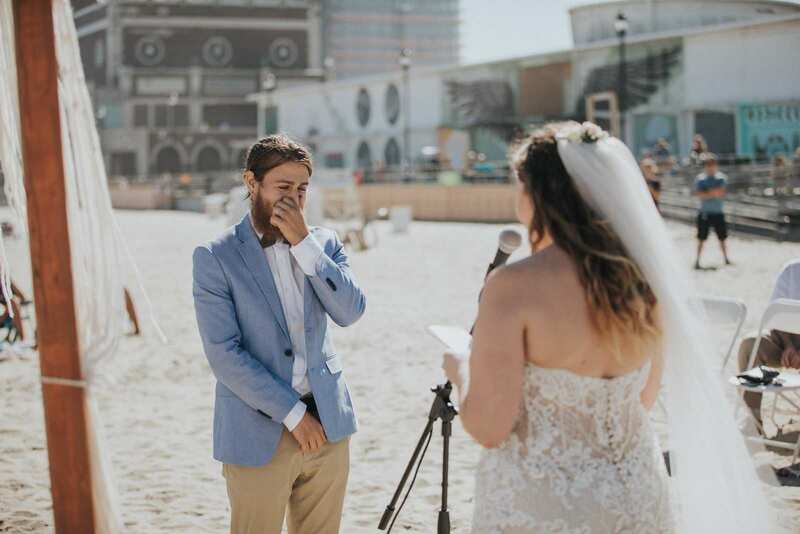 Despite having a first look and seeing each other for hours before the moment of vows, both bride and groom still got more than a bit emotional. 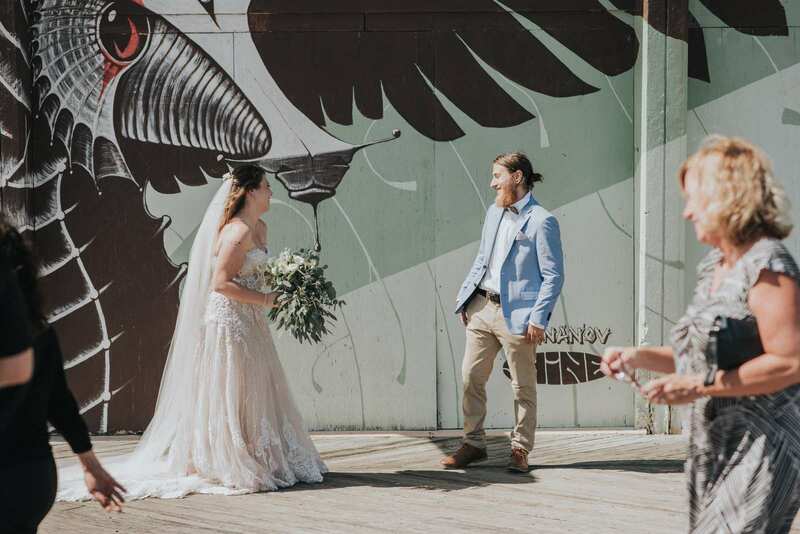 Should you do a first look? 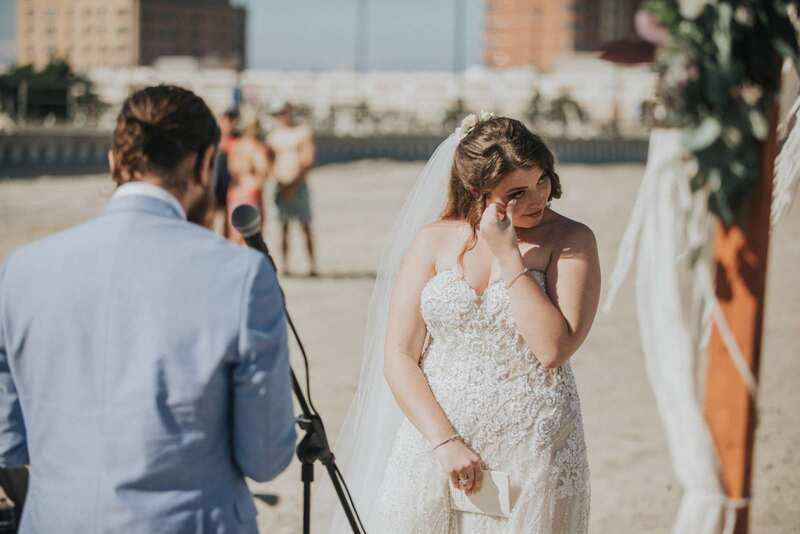 It is totally up to you but we often find a first look takes nothing away from the many emotions of the wedding ceremony. 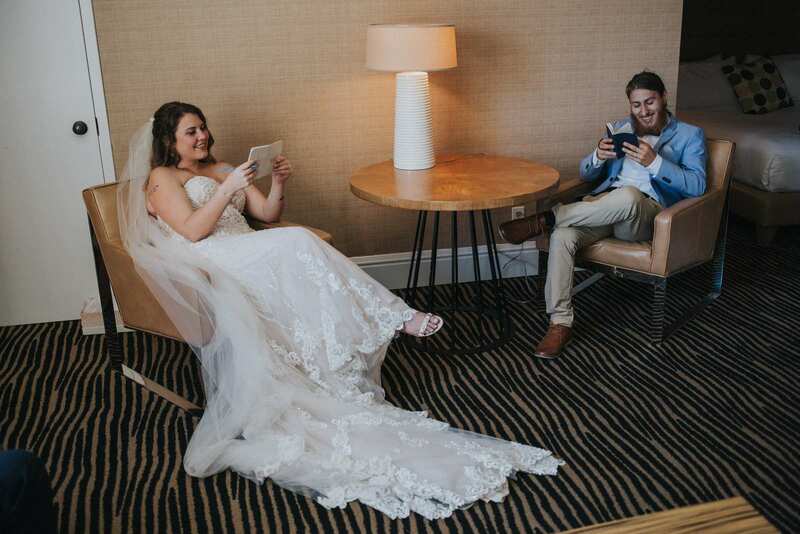 This is the perfect example! 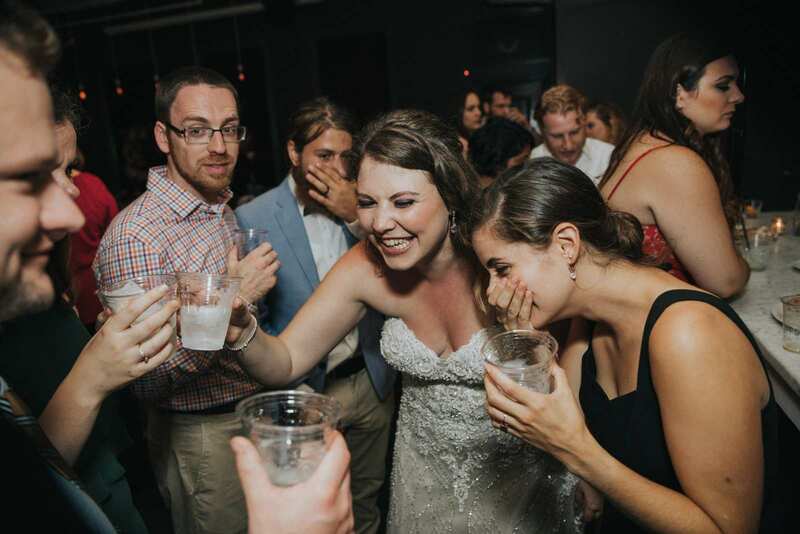 This was not bubbles, rice, or even birdseed being thrown at the newly married couple; it was pellets of hops! 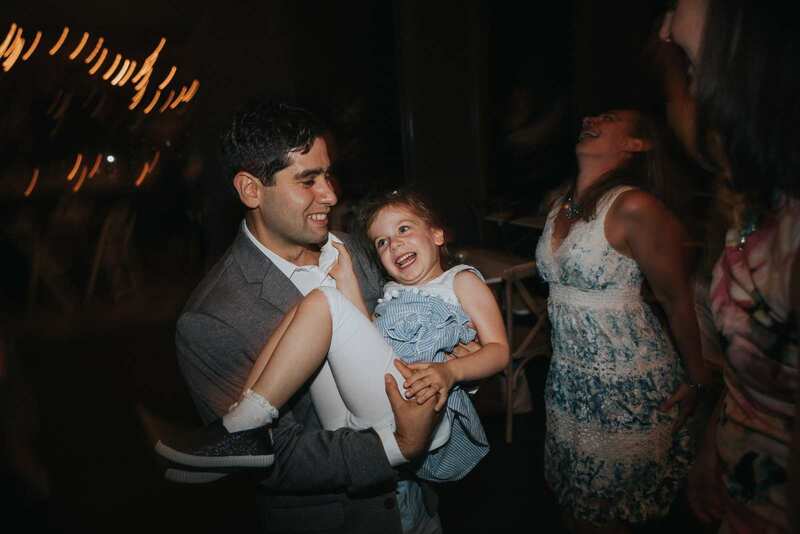 And it actually kind of hurt when it smacked us in the head but the moments captured during it were one of a kind. 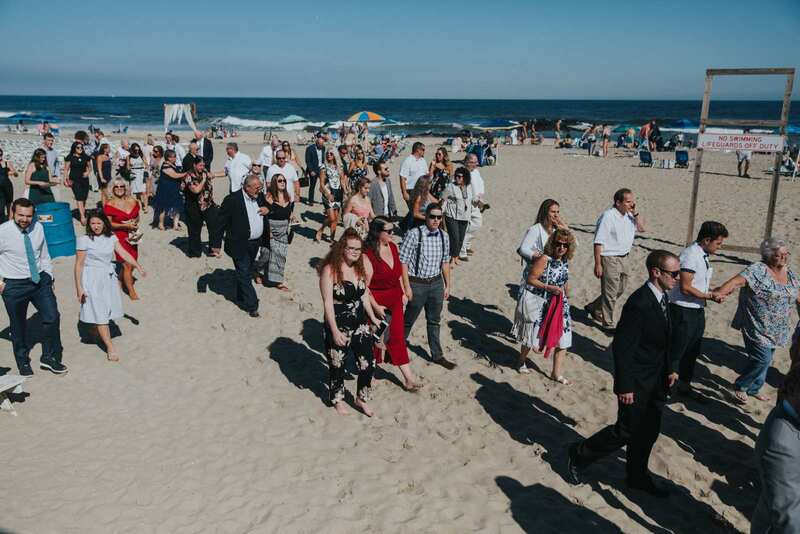 The guests makes their way from the ceremony site on the beach, to greet the bride and groom, and then just down the road to Porta in Asbury Park for the fun filled reception! 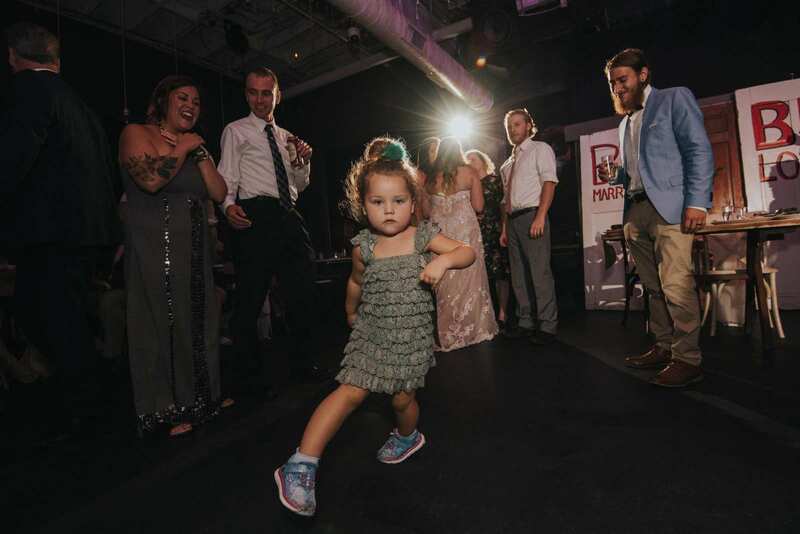 Even if it isn’t a stereotypical or “important” moment that you would find in an album. 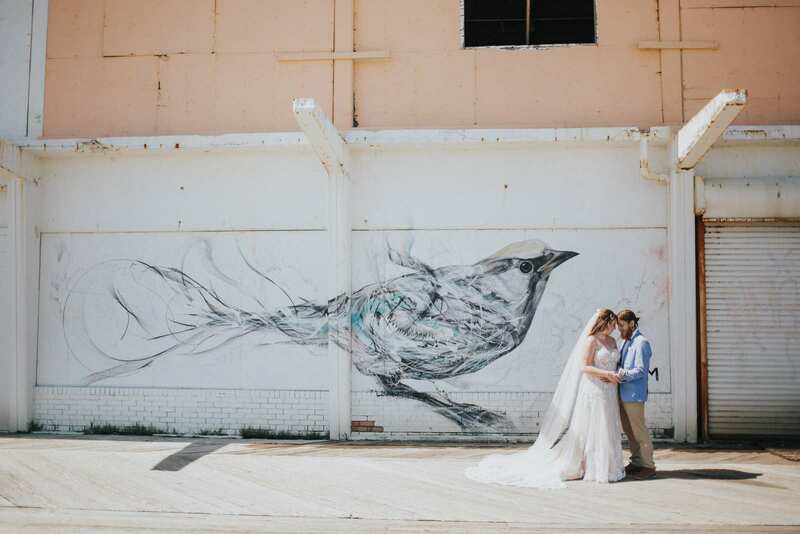 We think photos like this really fill in the blanks of the wedding story of the couple! 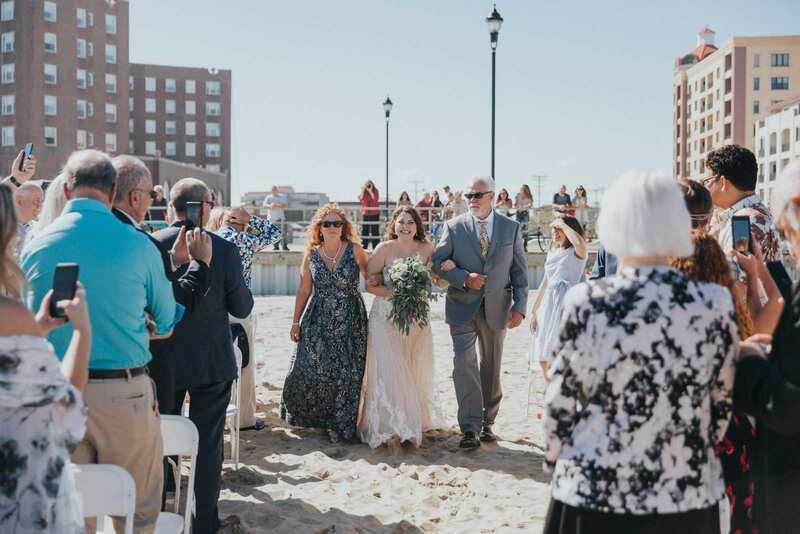 Some of the interior and detail photos we captured showing off the reception room for this wedding at Pizza Porta in Asbury Park. 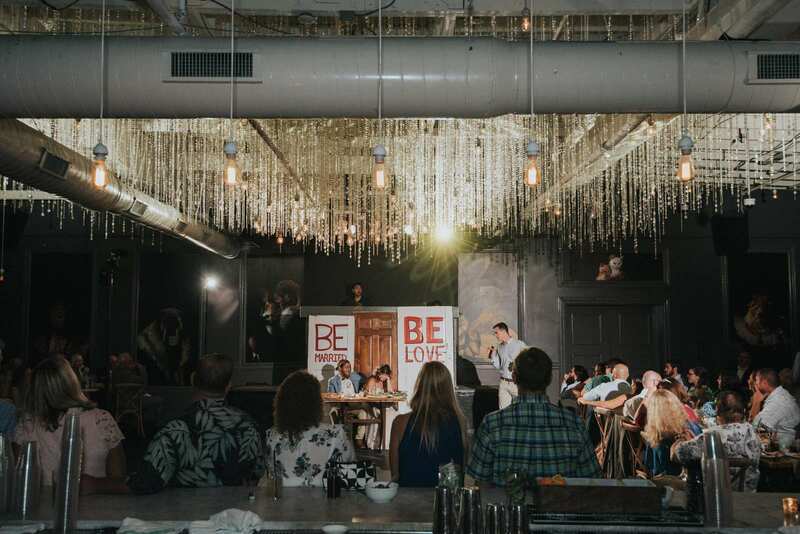 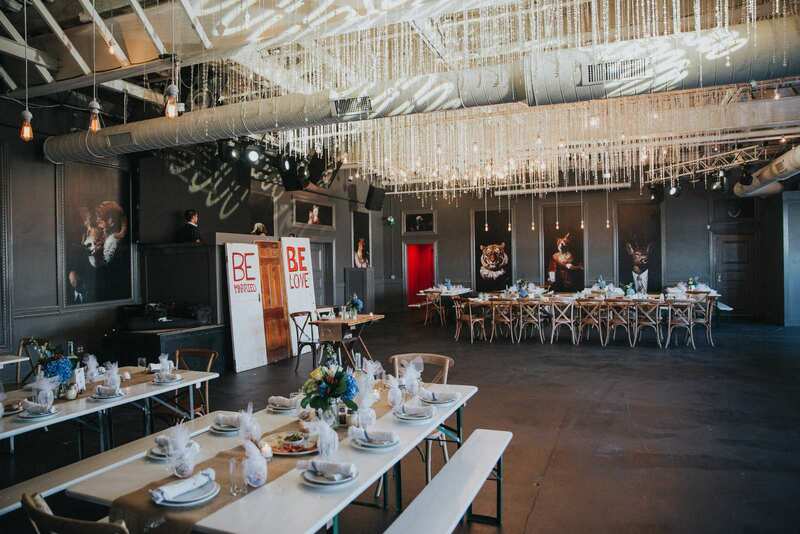 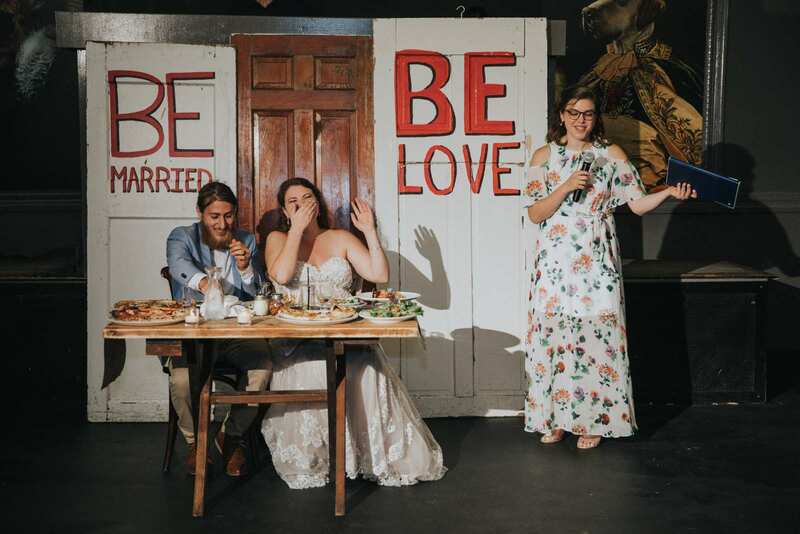 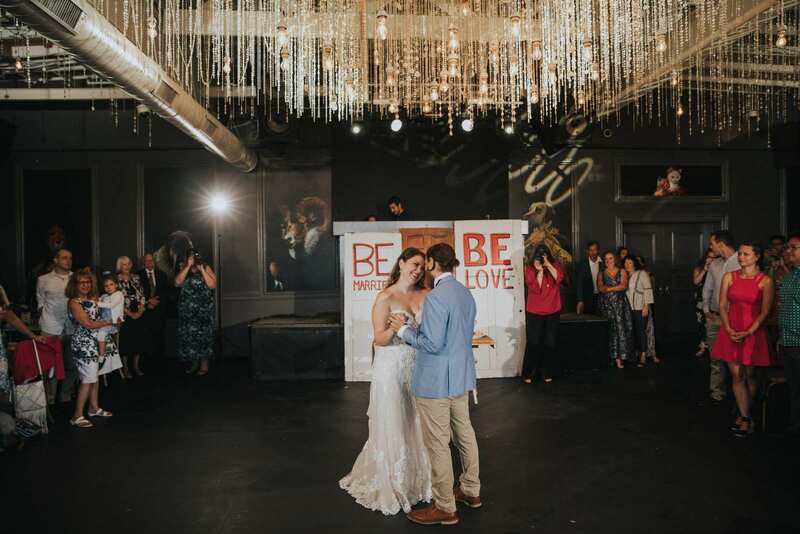 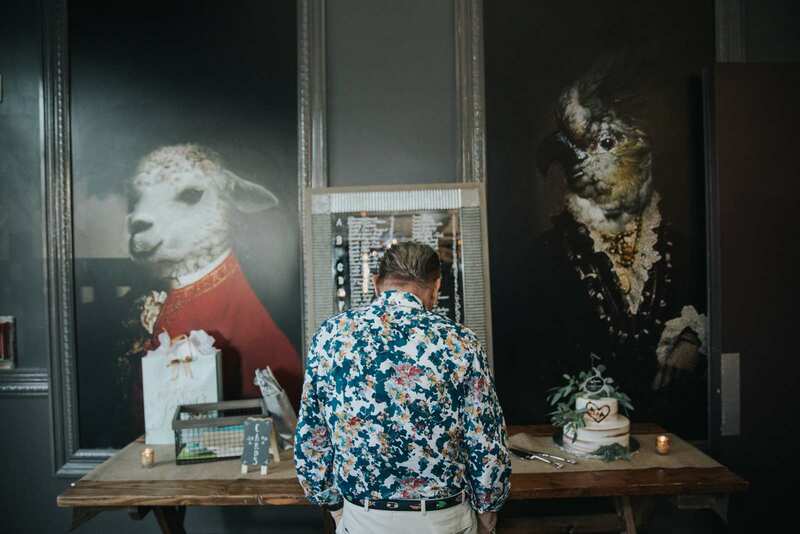 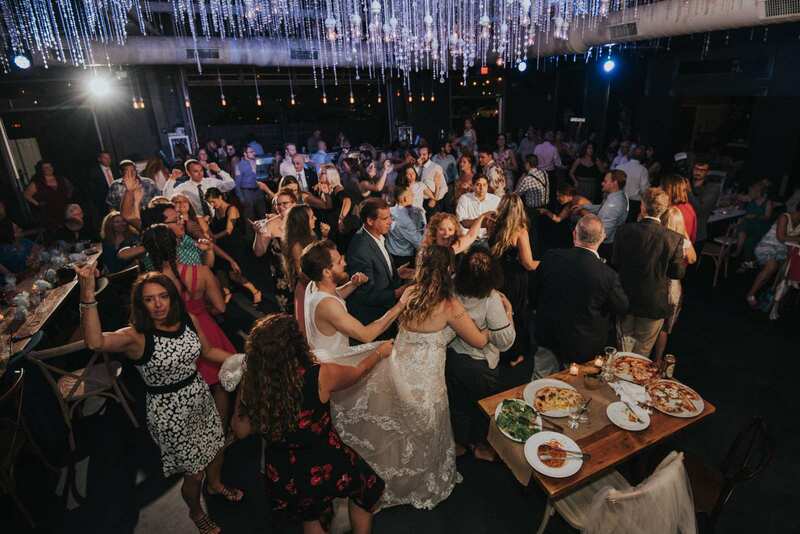 We love the wall art, tables, hanging lights, centerpieces, and basically everything else about this super unique venue! 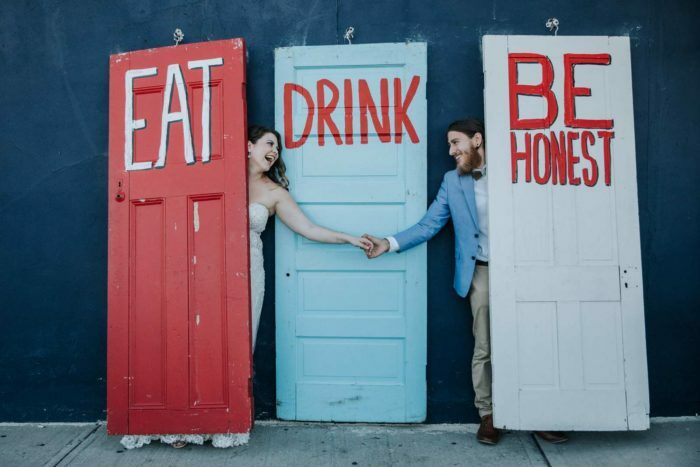 A quick portrait of the newly married couple outside Porta with their famous tri-color doors before we headed in to cocktail hour! 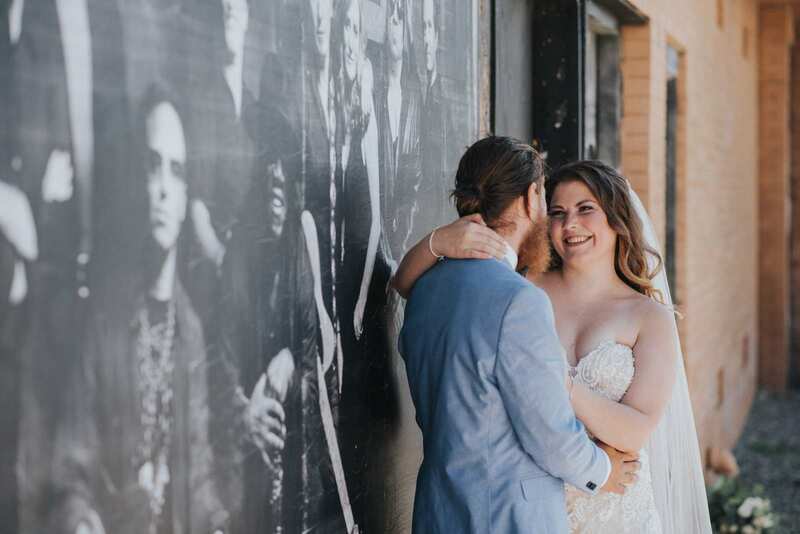 We never thought they would actually fit behind them and look so great doing it! 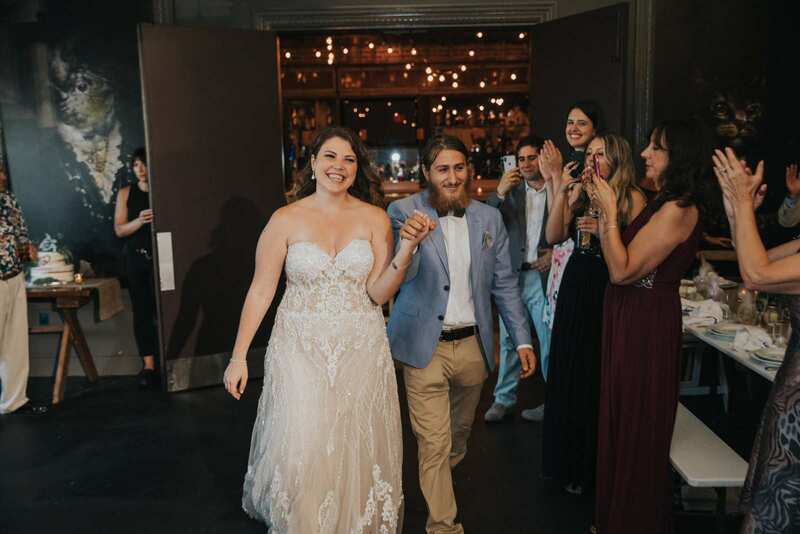 The bride and groom make their grand entrance to their wedding reception at Porta to the cheers of friends and family. 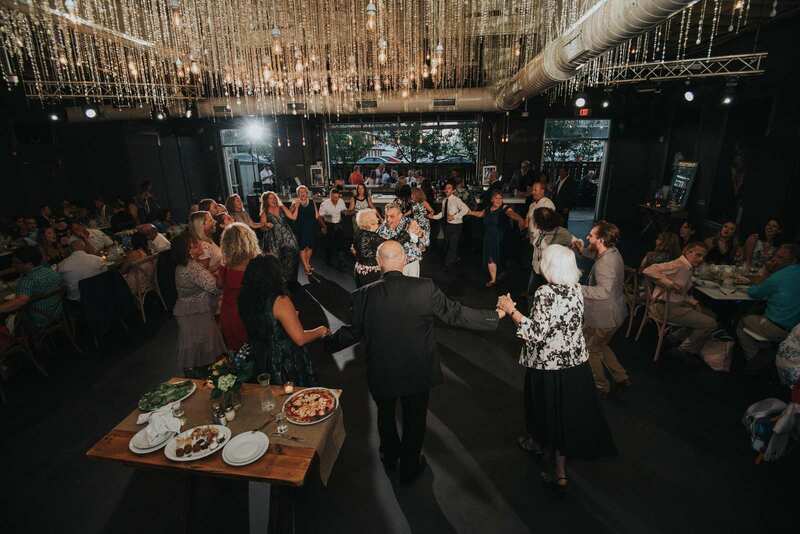 The first dance together and then their dances with their parents in the center of the room. 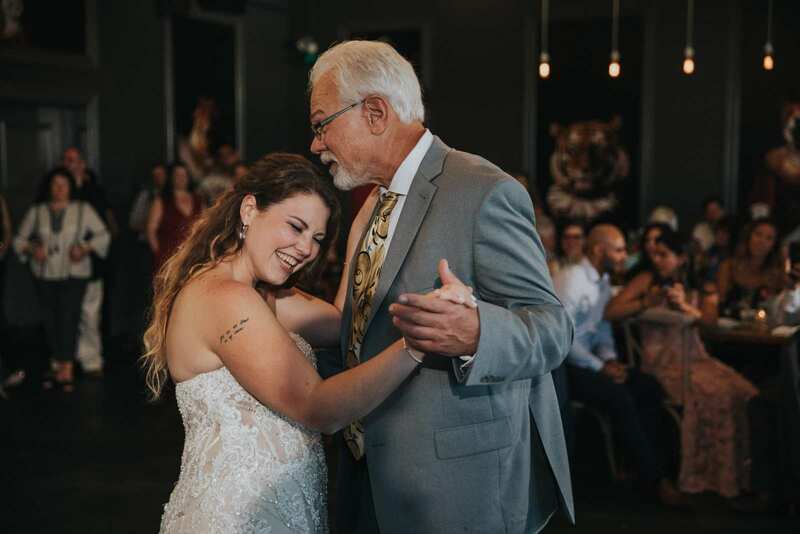 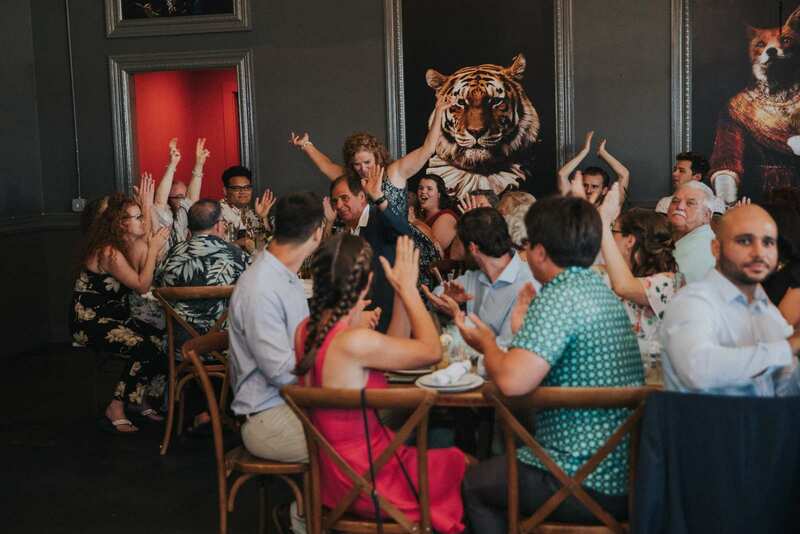 We love to capture photos during the reception that show off the room as a whole, the emotions of everyone, and then even the reactions of those in the background of the wedding! 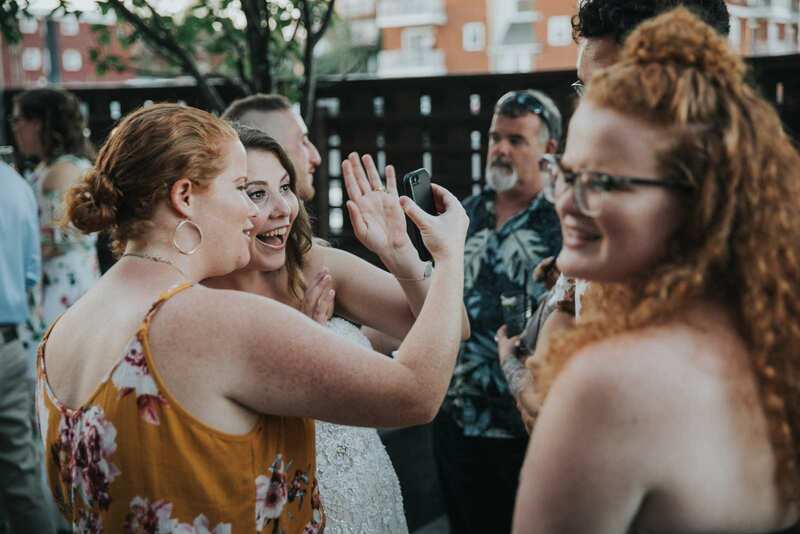 Some of the candid photos we captured of everyone greeting each other and just hanging out enjoying the atmosphere before dinner (delicious pizza) was served. 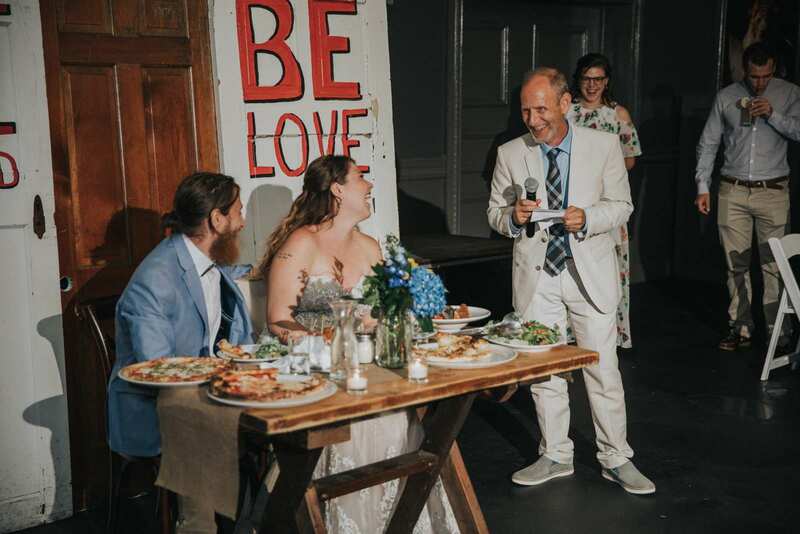 The toasts during the wedding reception! 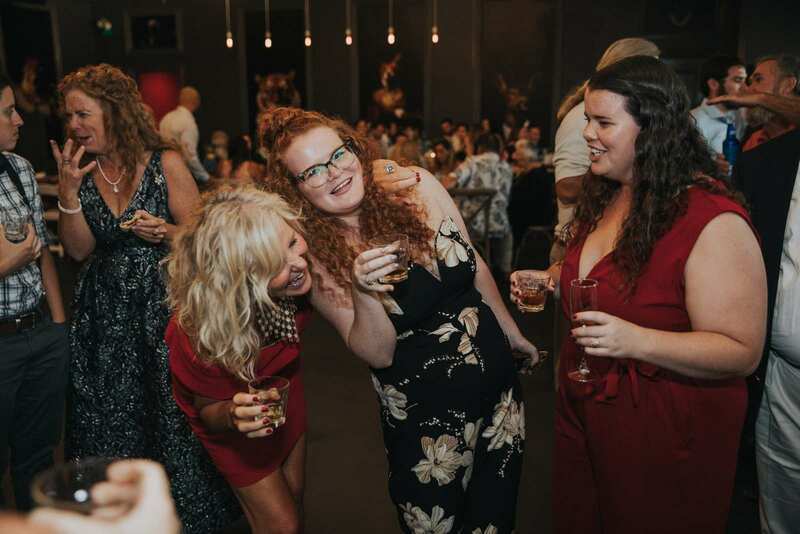 These are always a great time for us seek out some creative angles and really capture emotions which can range from fondness, embarrassment, uncontrollable laughter, and love! 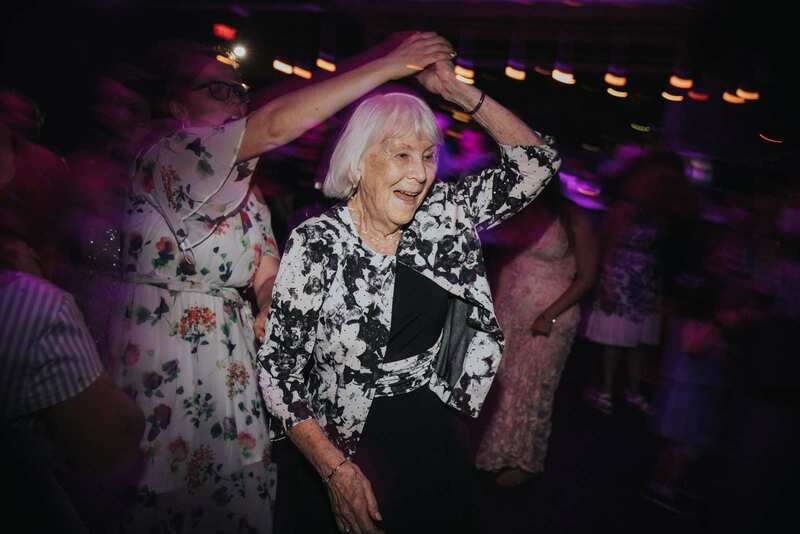 The last but certainty not least photographs of the wedding day – all of the dancing during the party! 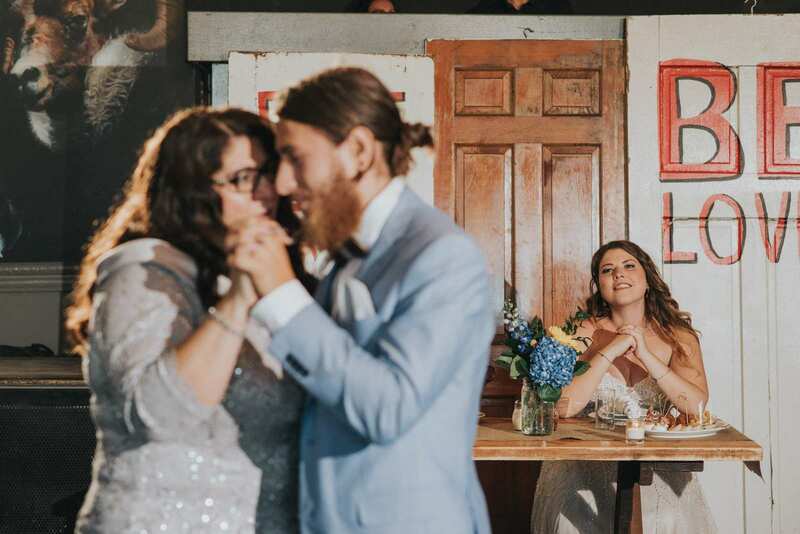 The multi color lights all over the Porta reception room gave some really awesome look to the background and ambiance of these party style candid photos! 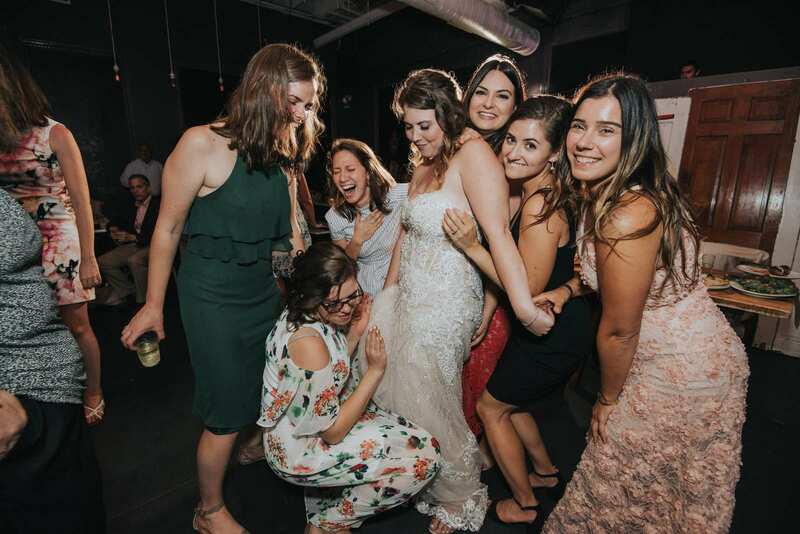 We always try to capture multiple photographs on every wedding day that set the stage for and then show the detail of the moment. 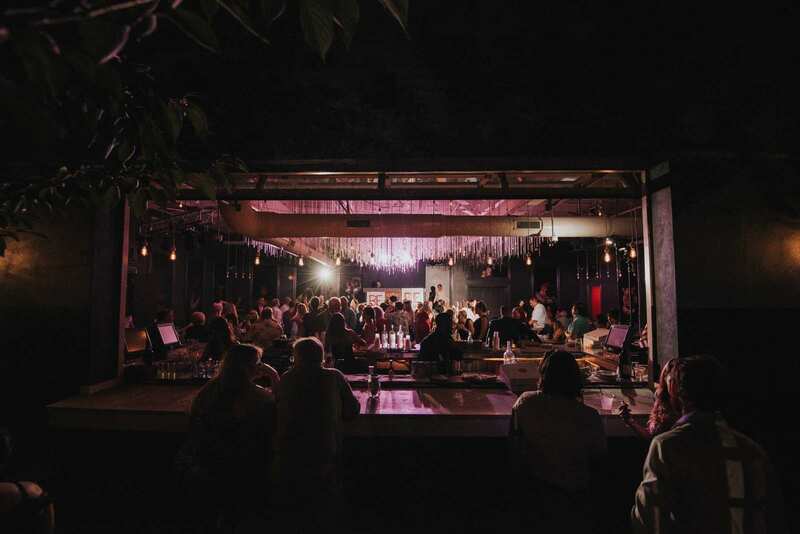 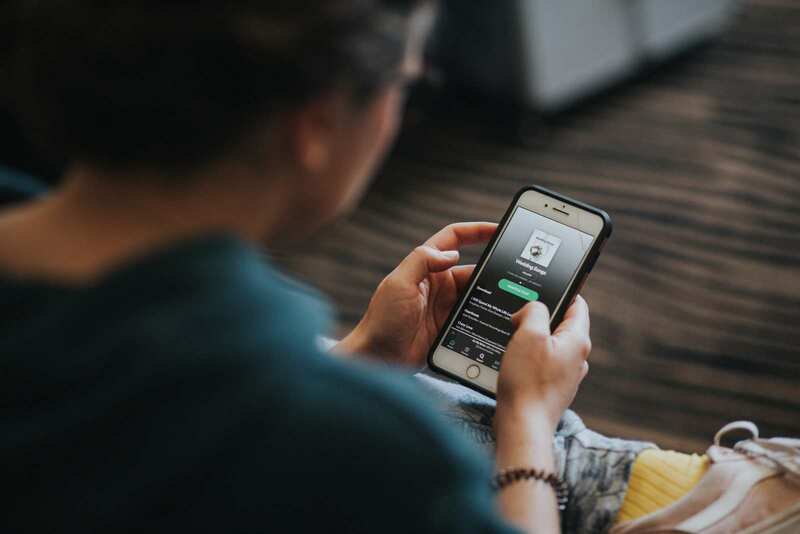 Some focus on specific guest and people while others are more for the ambiance. 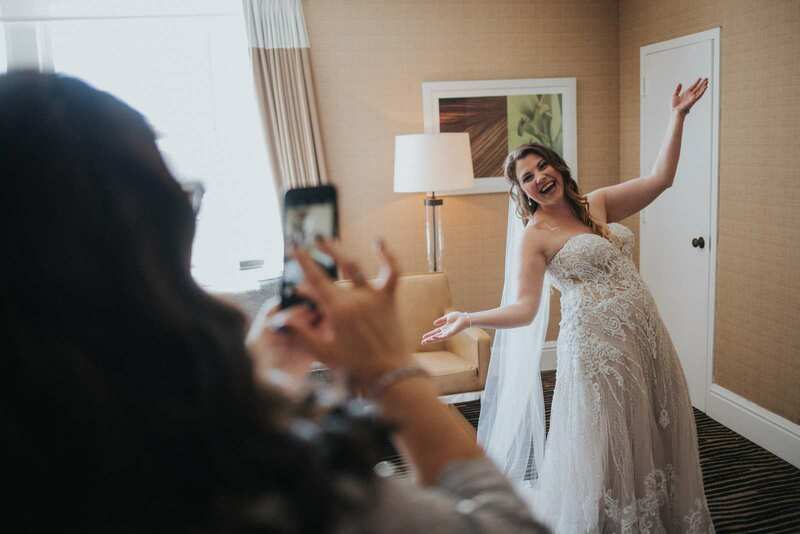 It is just all part of our one of a kind wedding photography style! 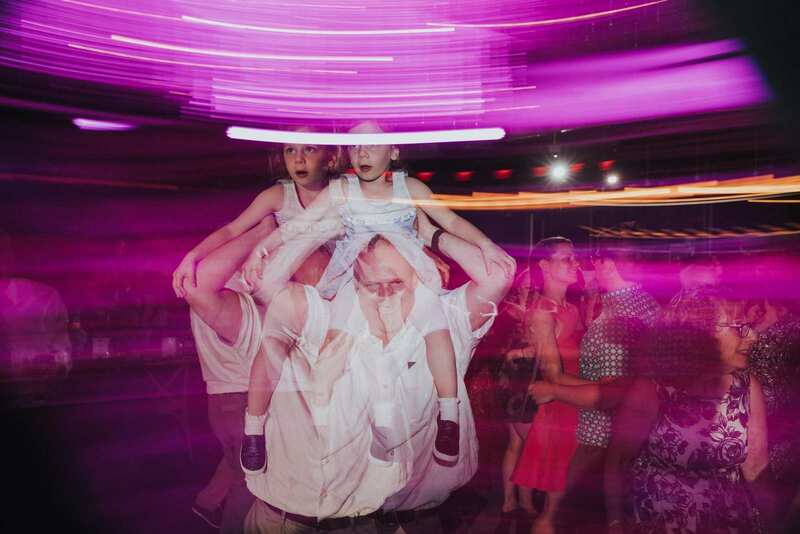 Just check out the few images above and below this for the perfect example! 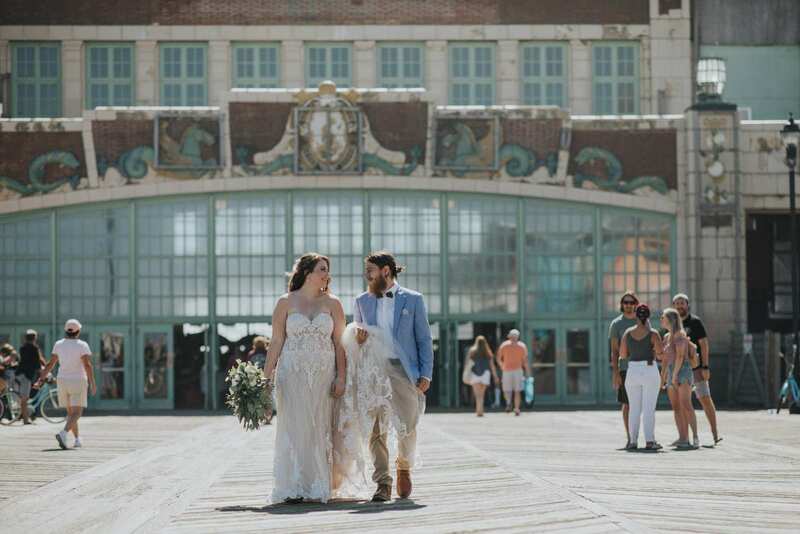 Asbury Park is a perfect spot to photograph for weddings, engagement sessions or pretty much anything else any time of year. 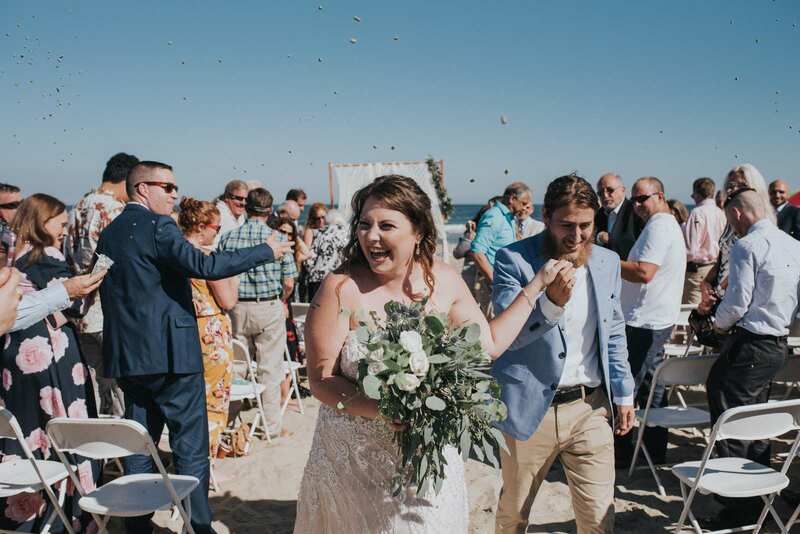 If you are looking for a wedding photographer to capture your wedding day here, somewhere nearby in in New Jersey or anywhere else in the tri-state area, Contact Us and we can set up a time to talk more!